When asked way back in July if I would write a piece on a Day in the life of an Alpaca Judge it seemed such a simple task, now with less than 24 hours to go to the copy deadline I can’t help but think that hasty acceptances or decisions are usually the precursor to regret. Even after 3 months, I cannot really see why anyone would think the life of an Alpaca Judge interesting, especially this one. What I have found since becoming a judge is that it has opened up some fantastic opportunities, both in terms of the people you meet and the circumstances that you meet them under. One of the most enjoyable jobs that I have taken on is that of instructor for the BAS judge-training programme. A Typical teaching day is started, whether it is foundation level or higher, with a group of delegates looking nervously expectant. What they never seem to realise is that we instructors feel the same, I look out and wonder what experience is hidden in the room, what real knowledge is there, and more importantly how receptive will the students be. For the higher levels you of course wonder what knowledge has been retained from previous courses, after all this will be the tell tale as to how effective you have been as a tutor previously. Of course, those who have undergone the training know that all runs like clockwork with every one having a great time. Day one starts with some instructive power point presentations and the trainers revelling in the phrase “you need to learn that, it will be in the exam”, all the time watching the students trying to absorb theory, advice on practical alpaca assessment, and fibre technology, all in the space of a few hours. At the end of the day the exam process is started and the look of fear, would for the sadistic, be reward enough. I have seen hugely experienced breeders go into meltdown at this stage, I have seen “city high flyers” go grey and I have seen the inexperienced revel in it. The look of relief, touched with confusion, when it is over is indescribable and it has been known for some to find the nearest pub as quickly as possible. I can’t think why, mind I’m not sadistic! Whatever the event the exam is just to tell us how well we have taught so that we can put it all right the next day. Usually during the group dinner some one will be brave enough to ask how well had they done in the exam, and rarely seem convinced when they are told not to worry, everything will drop into place tomorrow. Day two does bring with it the realisation that the jigsaw is coming together, and by the end of the day, a tangible air of confidence and understanding is evident amongst the students. The bit I enjoy most, the look of utter exhaustion mixed with elation on the student’s faces as they drink that last cup of tea before leaving. Elation at what you might ask, I like to think survival and success. Of course, as the first class enters I have to try to clear my mind, showing is serious business and my decisions can have far-reaching implications. However, that said I do like to try to make sure that the atmosphere is relaxed, after all this is supposed to be an enjoyable experience for all. Personally, I like to be respectful to exhibitor and alpaca alike but that doesn’t preclude some light banter. 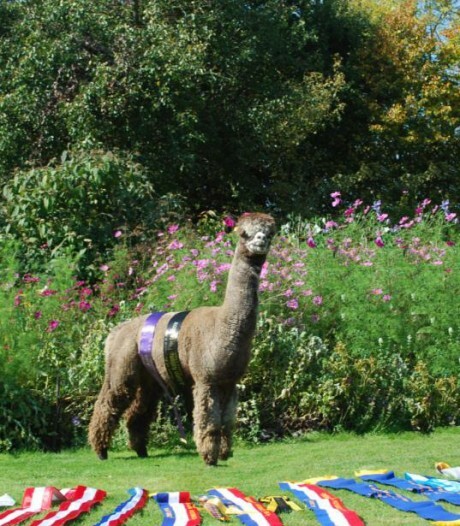 I well remember a show where an exhibitor had the misfortune to have an alpaca stop to have a pee as it entered the ring, no problem there and audience and officials alike took it in good part. A class or two later the same exhibitor is entering the ring, a different alpaca in hand and this one stops for a pee…. and a poo! Again everything stopped and we waited….. and waited….and waited. Now of course said exhibitor was embarrassed and got redder…and redder…..and redder. Eventually we let him stand in the middle of the ring and continued with the class, light relief for all other exhibitors, and one alpaca. This sort of incidence is always a useful reminder that whilst we may be under the impression we are running things, the alpacas always control events. 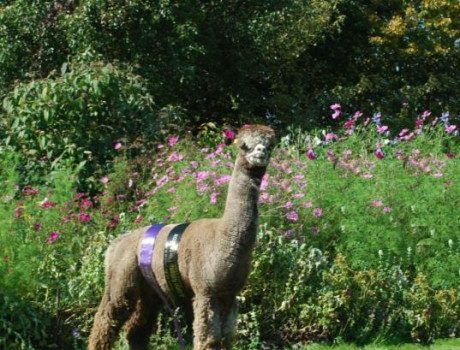 Inevitably the main thing is to remember is that we are trying to find the best alpaca in any given class and no matter the moments of light relief, this has to be done. This in itself means that as judge I have to get up close, and sometimes very personal, to the alpacas, which are needless to say, always well prepared by the owners for such inspection. Many is the occasion I have received a hefty kick on the shins for my troubles, and whilst trying to give the impression that it didn’t hurt, have looked at the handler to see a huge grin. The thought has crossed my mind that the alpaca may well be better trained than I thought, after all I didn’t place it the last time out either! That said we do get the alpacas judged swiftly and decisions are reached, often with some agonising but never compromising on the core values, namely fleece quality and conformation. Then as we all know comes the oral reasoning, and my personal belief is that this is the important bit. Watching the actual judging can be like watching paint dry, so the oral reasoning should be the bit that informs and entertains the exhibitors and spectators, otherwise why bother showing. I always try to paint an accurate picture so that everyone knows what my decisions were based on, and hopefully this can also help people in making breeding decisions. Remembering when I am judging what I feel like when I am an exhibitor helps keep me grounded, after all nobody likes a judge who is censorious or arrogant(please, no postcards). It has been my experience that show organisers like to keep the ring full all day so whatever the size of show I have always been kept busy, with lunch taking a poor second place. I know….. I’m never going to waste away. As the day nears its end, the championships loom and the expectation grows, there is no doubt that one becomes more serious. Show champions tend to viewed as having being vested in almost mythical qualities and this is always in my mind when I award a Show Champion ribbon. There is a tendency to forget that all shows only turn up the best on the day, not necessarily the best ever Alpaca. The show closes and you realise that tomorrow will be just another day but I do like to say thank you to both stewards and exhibitors alike. To me both sets of people are vital and it behoves me as judge to remember that without them, the show circuit cannot prosper, and I cannot have my day in the sun. Of course, once the show is over there is a chance to talk to the exhibitors and spectators; this can be enjoyable and or excruciating. On the one hand you have the majority who would merely like to know what you saw in there alpaca and better understand why they were not placed higher. Often these are the people that when you talk them through their alpaca see faults they never realised were there. You have the ones that genuinely believe they should have won, and no amount of explanation can persuade them there were better in the ring on the day, and then of course you have other judges. I’m saying no more on that subject! In chatting to an exhibitor after a show in Canada she reminded me that I had not given a first place in a black male class, and then went on to say she had agreed that my reasoning outlining colour contamination as a major factor was correct, and that she would never use her male for breeding in her own herd. In the next breathe she told me that she had sold breedings to someone else though because that didn’t matter. Perhaps my reasoning wasn’t detailed enough. I always have believed that it is an honour to be asked to judge a show, and it is also the least work, the others work for months on end to make it all happen. You now might understand a little more about a day in the life of a judge, it is pretty much like any other day really, you are dependant on others.